Author J.K. Rowling says that writing the last of her seven Harry Potter books is proving to be "fun in a way that it hasn't been before." "To an extent, the pressure is off, I suppose, because it's the last book so I feel quite liberated," she said Tuesday. "Now I can just resolve the story." 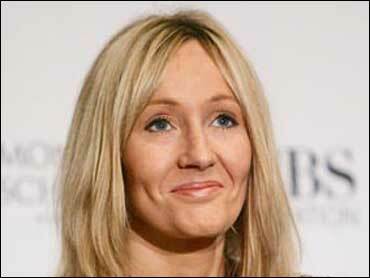 Rowling was in the United States for the first time since 2000 to take part in an authors' reading for charity. Rowling, Stephen King and John Irving were scheduled to read from their own works on Tuesday and Wednesday nights at Radio City Music Hall. "An Evening With Harry, Carrie and Garp" is supporting two nonprofit organizations: The Haven Foundation, King's choice, which helps performing artists whose accidents or illnesses have left them uninsured and unable to work, and Doctors Without Borders, Rowling's pick, a humanitarian group that delivers emergency aid in more than 70 countries. King, who came up with the idea after doing a reading for one of Irving's charities, said they hoped to raise at least $250,000 for each group. Rowling said she was "well into" writing the seventh Potter book. While she will miss working on the series that has made her a global publishing phenomenon, there would also be an element of freedom, she said. "There will also be a sense of liberation as well because there are pressures involved in writing something that's popular. And wonderful though it's been, I think that there will also be a certain freedom in escaping that particular part of writing Harry Potter," she said. In talking about the writing process, both Irving and Rowling said they worked their plots out in advance so that they knew going into the writing whether they would be killing off characters, something which made writing the death scenes somewhat easier. "I have a kind of casualty list of which characters make it and which characters don't before I write the first word," said Irving, author of such works as "The World According to Garp" and "The Cider House Rules." "By the time I get to write those death scenes ... I'm not truly as emotionally affected when it comes to writing those scenes. It's as if they've already happened." Rowling agreed, although she acknowledged that it still wasn't always fun to do. "I don't always enjoy killing my characters. I didn't enjoy killing the character who died at the end of book six," she said, declining to name that person in case someone had yet to finish the book. "I really didn't enjoy doing that but I had been planning that for years so it wasn't quite as poignant as you might imagine. I'd already done my grieving when I actually came to write it." King, whose many works include "The Shawshank Redemption" and "Carrie," said he was looking forward to the last Potter book. "I want to read the book. I love that series," he said. Irving said he and King considered themselves as "warm-up bands" for Rowling, and assumed the crowd at the readings would be younger than those who read his works, and largely made up of her fans. "I'm a little intimidated by the age of the audience, it's not my usual audience," he said.